Step Lighting – Step It Up! Step It Up with Step Lighting ! Successful landscaping considers all areas and aspects of a space, working within client specifications to find a balance between amenity, use of space, atmosphere and an inherent ornamental value. Positioning of plants or shrubbery, access routes, seating areas, decking and steps are extremely important, as well as sourcing suitable lights to illuminate these features. The concept of the ‘outdoor room’ is popular with designers these days; incorporating lighting to totally transform the garden once darkness falls. One of the most frequent requests is for advice on how to light steps effectively. Although considered an essential safety feature, stepped areas can be an area of beauty, especially when illuminated. The term ‘Step Lighting’ is now considered its’ own garden lighting effect! There are several methods for highlighting steps, and many different fittings to achieve results. The most effective in our experience, shine light down onto the steps. Anti-glare lights mounted onto walls, sleepers or decking adjacent to the steps usually have either an ‘eyelid’, ‘louvred’ or ‘arc’ design to angle and diffuse the light. These can be recessed or surface mounted. Due to the beam angle, positioning lights every other step is recommended to create an even and elegant step lighting effect. 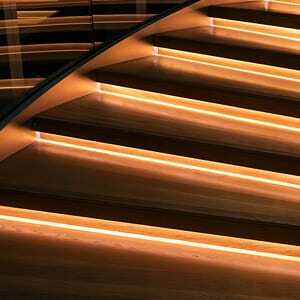 For ultimate safety, lights can recess into the risers for low level illumination across steps and to mark each tread. If recessing into brickwork, then a perfect product is a brick light which should replace a standard brick. The trick is to either use slatted or frosted brick lights with replaceable bulbs that are not too bright. If recessing into the step treads, then ‘marker’ lights are a sensible option on each side of the steps. These emit a low-level light from cut-outs within a raised walk-over dome. Ideally, louvres or glare shields will be part of the design, to ensure all light emits downwards and outwards creating a “spreadlight” effect. For a more contemporary look, highlight steps or adjacent structures with waterproof LED strip lights. These versatile lights lend themselves so well to straight lines and are available in various colours. Mounting strip lights inside opal lens profiles diffuse light beautifully and, again, prevent dazzling those accessing the area. Lumena Lights stock a wide range of Step Lights, Brick Lights and waterproof LED Strip Lights. The team are always happy to advise on the right light for your project and how to power them.